Panasonic TX-P50VT50 review | What Hi-Fi? The Panasonic TX-P50VT50 is the flagship plasma TV in Panasonic’s 2012 Viera range. It arrives for review hot-on-the-heels of the Panasonic TX-P50GT50, which is the next model down the range. The VT range adds a few features and also comes bundled with some extras, which we'll come to shortly. Given that Panasonic scooped the lion’s share of awards in the TV category last year and we’ve already hailed the TX-P50GT50 as "the plasma TV to beat in 2012", our expectations for the VT50 are suitably high. One of the unique features on the VT50 range is an Infinite Black Ultra filter, which aims to deliver better than ever black levels. On the outside, the VT50 has a single-sheet-of-glass-design, and there are minor dfifferences in the styling compared with the GT model. You also get two pairs of active-shutter 3D glasses in the box – Bluetooth-powered and rechargeable – and a Viera Touch Pad Controller remote control. More on this later. All the other features found elsewhere in the Viera 2012 range are present and correct, as you'd expect on the flagship model. So there’s the same G15 Progressive Full-HD NeoPlasma display panel, albeit with the Infinite Black Ultra as opposed to Infinite Black Pro filter. The High Contrast Filter Pro and 2500Hz Focused Field Drive are also new this year, taking care of those deep black levels for a dynamic picture and motion processing. The Dual Core Pro4 Processor allows for multitasking of smart TV apps and a faster internet experience all round. Connectivity is exhaustive as you’d expect. There are four HDMI inputs, plus component, Scart and composite connections, while three USB inputs and an SD card slot give you options for accessing pictures, music or movies on portable media. There are Freesat HD, Freeview HD and analogue tuners, and a digital optical output for taking digital sound from the HD tuners. Wireless internet is integrated into the panel or you can make a wired connection via the Ethernet slot. The set is DLNA-certified, too. As well as supplying the standard 2012 Viera remote control, Panasonic also throws in the Viera Touch Pad Controller. This compact remote gives you, as the name suggests, a little touch sensitive control, which proves responsive and surprisingly easy to get to grips with. There are also volume and channel controls, direct keys for Viera Tools and Viera Connect, and back and exit buttons. The touchpad proves a smart way to flick your way around the interface while using it as a scrollable cursor comes in to its own with web browsing. We like it. The layout of the menu system and interface is the same as the rest of the Panasonic range and remains one of the simplest and most intuitive around. All key television settings are in the main menu, there’s a pop-up Viera Tools menu for accessing content on SD cards or USB storage devices, plus a separate but similarly simply laid out Viera Connect internet TV interface. Yes, there are rival firms who add more bells and whistles such as gesture control, but in a way the simplicity is refreshing and certainly makes it easy to use. Since the VT50 is THX-certified, you’ll find THX modes within the set should you want to use them, or you can dive in and make your own picture adjustments. While the THX settings are more than adequate, we prefer to set the TV to normal mode and make our adjustments. It’s certainly worth experimenting with key features such as Intelligent Frame Creation. It tends to be a matter of personal preference but we’d be surprised if you didn’t find the maximum setting a little unnatural. We liked it set to minimum or off. To cut to the chase, the picture quality all round is superb – and indeed very similar to the aformentioned TX-P50GT50. The tuners are strong, delivering clean pictures and smooth motion. Colours are nicely balanced, bright but not overblown, while there’s a first sign of those deep but detailed black levels with which we’ve become accustomed to on Panasonic TVs. There’s not much between the Freesat HD and Freeview HD tuners, though if pushed the former was a touch sharper in our test rooms. Most pertinent is that both are excellent. Spin the Blu-ray of Man on a Ledge and we continue to be suitably impressed with the picture performance. Black levels are deep and dark but detailed, skin tones are natural and full of subtlety and insight, and colours are expertly balanced. Fargo is a little noisy as Blu-ray transfers go but it does have some great tests of bright whites and dark blacks courtesy of the landscapes of icy Montana. And the Panasonic shows them off perfectly. Clean white snowy landscapes are set against solid black night skies, both capable of revealing any details on the picture. It proves capable with standard-definition content, too, the TV’s scaler proving excellent should you want it to do the task, with classic test disc Training Day looking natural, detailed and stable. And it’s no stinker sonically for a flatscreen TV either, delivering more authority and weight than we tend to find. We’d ideally do this TV justice with some external speakers but if not it’s fuller and better balanced than the average set. You can adjust bass and treble, choose preset modes and even try virtual surround sound if the mood takes you. Panasonic’s Voice Guidance Settings are here too – turn them on and you can be talked through the menus as you move around. This text-to-speech technology is aimed at blind or visually impaired users and is found across the Panasonic Viera 2012 range. Panasonic supplies two pairs of active-shutter 3D glasses. They use Bluetooth rather than infrared to communicate between glasses and TV, and they are rechargeable via USB. The glasses are lighter and more comfortable than the last generation specs and the 3D picture follows suit. The sense of depth is there but it's more subtle, making for a more comfortable viewing experience. Fast motion is handled competently and the picture retains the dynamic feel of the 2D picture. There’s the now fairly standard 2D-to-3D conversion mode here too, which converts any content from 2D to 3D on the fly. Performance wise the 3D pictures aren’t as impressive but it’s a neat feature and works quite nicely with 2D games. As for smart TV, the selection is strong and works quickly and effectively. Panasonic’s Viera Connect hub of internet content is pretty strong for 2012. There’s BBC iPlayer, Netflix, Skype, Actrax, BBC News, YouTube, Facebook, Twitter and a web browser. The neat layout is easily accessed and negotiated using the Viera Touch Pad Controller. Apps are presented in simple pages which can be customised so you have your favourites in easy reach and add more by visiting Panasonic’s marketplace. The Touch Pad works well as a cursor when using the web browser though the text input is still fairly laborious. The Viera Remote app for Android makes this slightly quicker, allowing you to enter text on your phone or via voice input before flicking it across to your TV. Even more clever is the ability to swipe content directly from phone to TV. An iOS app version is apparently due any day (though it has been prmised for a while now). The content itself performs well. iPlayer is fast and the ‘HD’ content especially looks good, while YouTube’s new-look smart TV app is pretty easy to find your way around – and, of course, hosts a mountain of content. So the Panasonic TX-P50VT50 is another superb Panasonic set. Fully specified, you’re unlikely to find much missing here in terms of features and connections. Performance is very close to the TX-P50GT50 but a few extras, including two pairs of active-shutter 3D glasses and the Touch Pad Remote Controller, help to justify the extra cost. 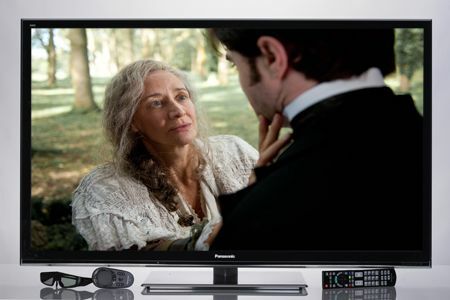 The Panasonic TX-P50VT50 is by any measure a worthy televison to head Panasonic’s plasma range in 2012.